7 Habits DVD by Stephen R. Covey – Free Video Clip – Discount! 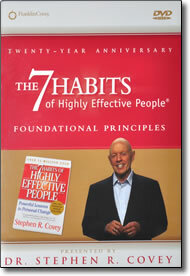 The 7 Habits of Highly Effective People was first published in 1989 by Stephen R. Covey. It has sold over 20 million copies since its first publication, and today still sells thousands each week. Now, you can learn the foundational principles of the 7 habits through live video presentations featuring Dr. Covey. Recognized as one of Time magazine’s 25 most influential Americans, Stephen R. Covey has dedicated his life to demonstrating how every person can truly control his or her destiny with profound yet straightforward guidance. As an internationally respected leadership authority, family expert, teacher, organizational consultant, and author, his advice has given insight and hope to millions. What inspires outstanding personal achievement day in and day out? The 7 Habits will make you more effective in your personal and public life. You’ll learn how to make these habits a part of your everyday routine. Perfect for anyone who wants to succeed in business, promote better personal relationships, and live a happier, more fulfilled life. I Bought this book years ago and had the CD. However I have miss placed it and would love a new copy.